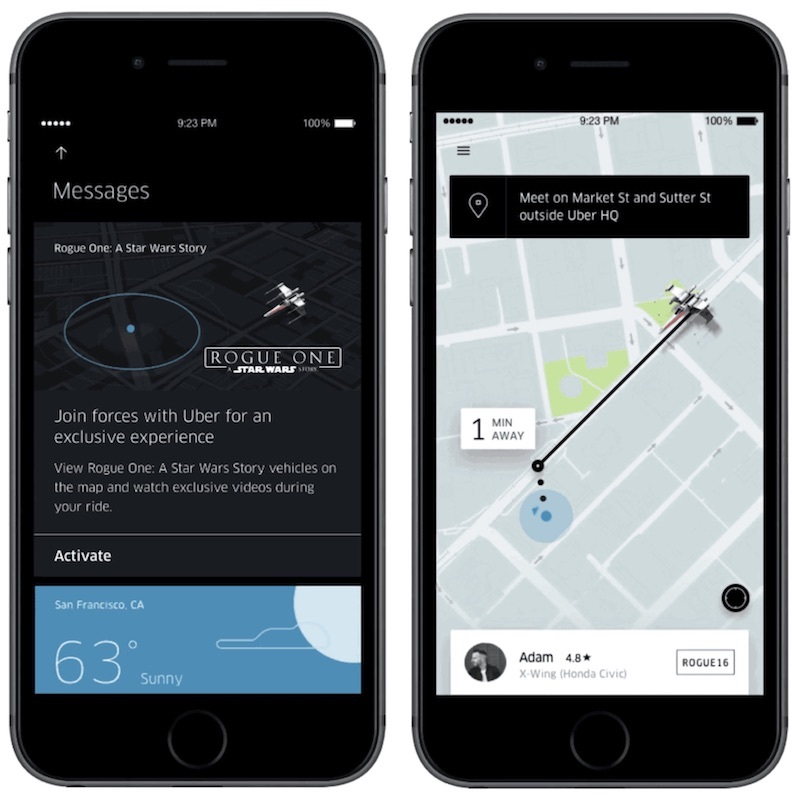 Uber has announced that users will today begin seeing a new update rolling out for the popular ride-hailing app, which transforms it into a themed Rogue One: A Star Wars Story experience. The visual update comes via a partnership with Disney, and replaces the usual Uber vehicle icons with a few easily recognizable starships from the Star Wars universe, including X-Wings. In addition to the visual update, users will also be able to watch "exclusive video content" from the film during their Uber rides if they choose to turn on the Star Wars theme. Uber said that riders in "hundreds of cities globally" will gain access to the update, although it didn't specify which cities might be missing out on the new Star Wars experience. Today we announced we’re collaborating with Disney on an activation that transforms the Uber rider app into a themed Rogue One: A Star Wars Story experience. The in-app experience, which Uber riders can opt-into, will unlock special Rogue One: A Star Wars Story features as well as access to exclusive video content. Riders will have to opt-into the new Star Wars update, which they can do by tapping "Activate" on the related Rogue One: A Star Wars Story card that will begin greeting app users today. The theme will run from today, December 12, through December 18. Rogue One: A Star Wars Story opens in theaters December 16. Last week, Uber faced blowback surrounding its newest version update, which introduced a way for the app to continue tracking each user's GPS location five minutes after their Uber ride is complete, no matter if the app is open or not. Uber said the move was to improve the overall performance and safety of the app, but many of its users responded negatively online. I went ahead and used Uber over the weekend despite the unnecessary "Always" location tracking. I had to go into restrictions to re-enable it, then after the ride was over go back in and disable it once again. Not sure how many times I'll be willing to go through the extra hassle. If they don't give back the ability to use location only while using the app soon, Lyft will be getting all my business going forward. What about Uber stop tracking it users? They excuse for doing it is for safety reasons. The drivers are already being tracked. And for this marketing, hope they don't become Waze, showing you ads in the middle of a ride or finishing it. They charge a huge margin and competition is needed. Cool would be to have an app that check ride prices among every service, be it Uber, Lyft, Cab... and call it automatically. The marketing is strong with this one.